You are here: Home » Blog » Which flowers are in bloom in Autumn? Autumn is already here. The third season of the year, when crops and fruits are gathered and leaves fall. The days are becoming visibly shorter and colder, the summery colors are starting to fade away and many flowers have already withered; does it make you feel nostalgic too? Vegetational activity is starting to slow down in preparation for winter days, but it doesn’t mean that there aren’t any flowers to enjoy in the autumn season. Some of them actually hold over from the summertime, helping us combat the first signs of the autumnal melancholy. Whether you’re looking to get a seasonal wedding arrangement or simply wondering which flowers can currently be purchased at the best price, we’ve prepared this list of flowers that can still please the eye in those darker, fall months. Allium, also known as ornamental garlic. Alstroemeria, commonly called the Peruvian lily or lily of the Incas. Anemone – which makes excellent cut flowers that should last in a vase for over a week. Aster – a beautiful perennial with yellow center and white, red, pink, purple, lavender or blue petals. Chrysanthemum – which can help reduce indoor air pollution. Cosmos – an herbaceous perennial from the sunflower family. Dahlia – an herbaceous perennial plant native to Mexico. Freesia – a very fragrant flower grown mainly for use as cut flower. Gerbera Daisy – florists’ favorite, right after roses and carnations; boasts a long vase life. Gladiolus – also known as the Sword Lily, is a perennial that signifies remembrance. Gypsophila – or Baby’s Breath, is a bushy plant that survives after a week when cut and dries beautifully. Hydrangea – a popular flowering shrub that blooms from late spring to late autumn. Iris – a hardy herbaceous perennial that comes in many color combinations, including blue and purple, white and yellow, pink and orange, brown and red, and even black. Kangaroo paw – it has no fragrance, but makes an excellent cut flower; originates from Australia. Lily – an herbaceous flowering plant growing from bulbs. 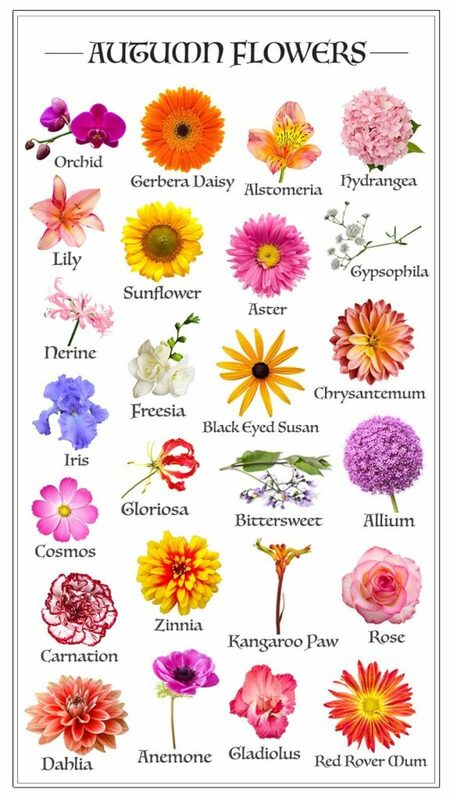 Its prominent flowers come in a wide range of colors including whites, yellows, oranges, pinks, reds and purples. Nerine – a pink, dashing autumn flowering bulb, which will flower for years once it accommodates in your garden. Orchid – very colorful and fragrant; popular potted houseplants. 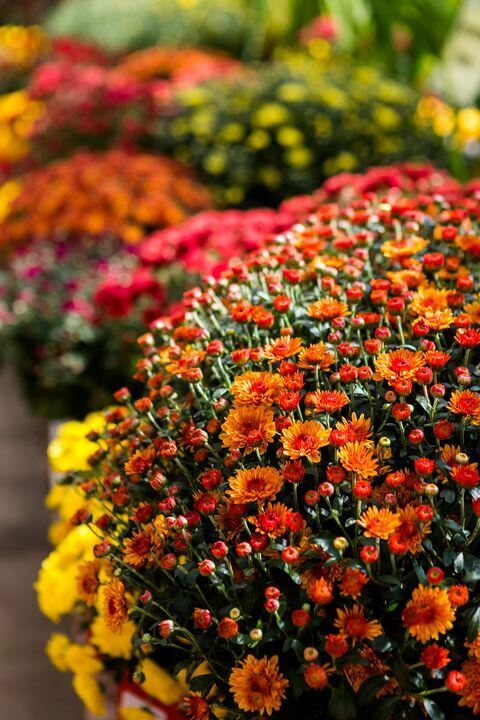 Red Rover Mum – blooms from late summer through fall; there are annual and biennial varieties. Rose – some of the garden varieties of this woody flowering plant bloom only in fall. Solanum dulcamara, or Bittersweet nightshade – a semi-woody herbaceous perennial vine. Sunflower – yes! The stunning suncatcher blooms through the fall season as well. Zinnia – an annual and perennial plant that blooms from mid-summer all the way until the first frost.